"The majority of my work is landscape but I also paint wildlife, still life, portraiture or whatever happens to excite me as a subject for a painting. The palette I use is comprised of a warm and cool selection of the three primary colors plus white and an occasional specific color that a subject may require for spice!" 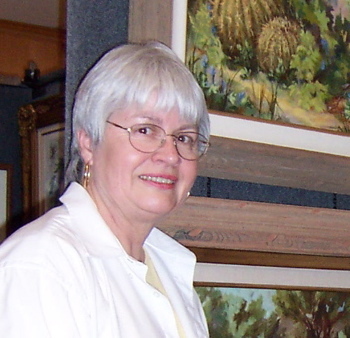 Linda is a member of the National Oil & Acrylic Painters' Society (NOAPS), Arizona Art Alliance, Mountain Artists Guild, and the Wickenburg Art Club. A long time Arizona resident Linda moved to the Southwest from the Pacific Northwest. She studied art first at the Phoenix Art Museum then through private lessons and workshops with well known artists. She formalized her art education with a degree program at Arizona State University where she received a Bachelor of Fine Arts in Graphic Design. This combination of education and years of painting have resulted in Linda's personal form of expression. Linda has taught both private and group classes as well as 2- Dimensional Art at Chandler-Gilbert Community College and workshops for various art groups. Linda's work is in the permanent collection of the St George Art Museum. Linda was also featured in the Arizona Collector's Guide. Linda Umphrey will be offering a classe on Tuesdays at "Granny Annie's Old Time Photos" in St. Michael's Alley Shops in downtown Prescott. The class is 3 hours from 10 a.m. to 1 p.m., space is limited so the classes are small. Cost: $20 per class. For further information, to reserve a place and to get a materials list, email Linda Umphrey.